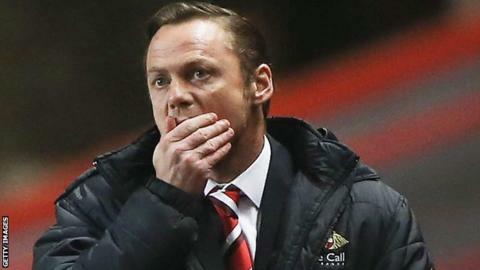 Paul Dickov has been told he will remain as manager of Doncaster next season despite the club's relegation from the Championship. Doncaster lost 1-0 to Leicester and were sent down after Birmingham's late equaliser in a 2-2 draw at Bolton. But Dickov, 41, says he has already clarified his future at Rovers. "Will I be manager next season? Absolutely. We have had conversations before today and the club want me to stay," Dickov said. "Obviously we are gutted and disappointed because it was everyone's aim this year to keep us in this division." Dickov, who took over in May 2013 after the club's promotion to the Championship, says he is determined to guide Rovers back into the second tier. "All our efforts now are to make sure we get promoted next season," Dickov said. "We came up a little bit short but it wasn't through lack of effort from the players, the club or the fans."